The history and future of the B-52 Jump to media player The B-52 is the US Air Force's "heavyweight of the skies". The six-engine military plane has been involved in conflicts since the 1950s - and three generations of pilots have flown in one. US boosts European presence with B-52s Jump to media player A number of US long range heavy bombers have been stationed at RAF Fairford in Gloucestershire, as the US boosts its military presence in Europe. 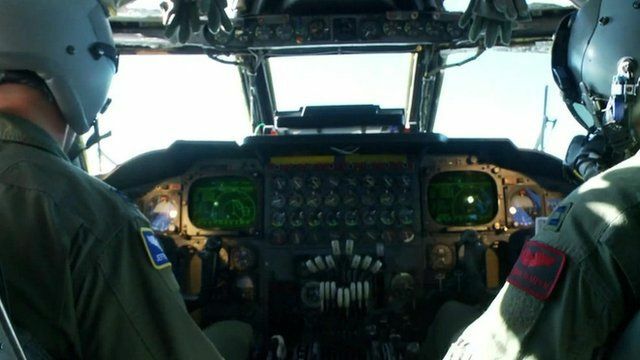 On a training run with a B-52 bomber Jump to media player Jonathan Beale takes to the skies in a US B-52 bomber on a training run, as a number of long range heavy bombers are moved to Europe for the first time in 10 years. US nearly nuked North Carolina in 1961 Jump to media player Author Eric Schlosser talks to the BBC's Katty Kay about his new book, Command and Control, which chronicles America's nuclear mishaps and near misses. The B-52 is the US Air Force's "heavyweight of the skies". The six-engine military plane has been involved in conflicts since the 1950s - and three generations of pilots have flown in one. And its not expected to go away - the B-52 programme is planned to continue until 2040, as its range and capacity is unique among US military planes.